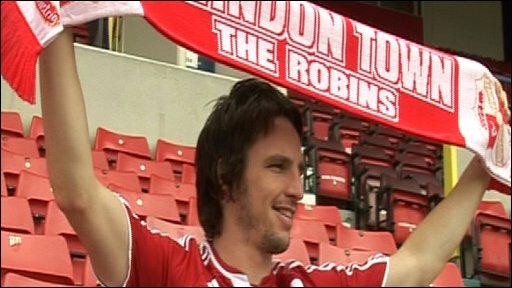 Swindon Town have completed the signing of former Leeds United midfielder Jonathan Douglas on a free transfer. The League One side beat off the challenge of several other clubs to clinch the 27-year-old's signature. "In the end it was an easy decision on a football basis," Douglas told BBC Points West. The Republic of Ireland man played at full-back for Leeds last term but will play in central midfield for Swindon, adding some much-needed strength. "I've played in the division for a few years, played a lot of games so hopefully can add some experience," said Douglas. He is the club's fourth signing of the summer following Gordon Greer, David Lucas and Alan O'Brien. Manager Danny Wilson's top priority this summer was to strengthen the spine of his Swindon team, and Douglas's signing will undoubtedly help that. And the admiration appears to be mutual. "He's one of the main reasons why I signed here. He seems a good man to work for," added the Irishman. I quote from others, that Douglas is a solid midfielder, with a slight tendency to pick up a few cautions. With Greer in the centre of defence and Lucas in goal, he will now be focusing his attention on replacing star striker Simon Cox. Douglas has already played alongside all of Swindon's other new faces, with Lucas at Leeds, Greer at Blackburn and O'Brien for the Republic. He made 166 appearances in four seasons at Elland Road after joining from Blackburn Rovers, initially on a season-long loan. At the time he left Elland Road, Leeds said it was "exceptionally difficult to agree terms acceptable to both parties" with Douglas.